jowar roti or jowar bhakri are flat breads made with sorghum flour. these rotis are also called as jolada rotti in karnataka. 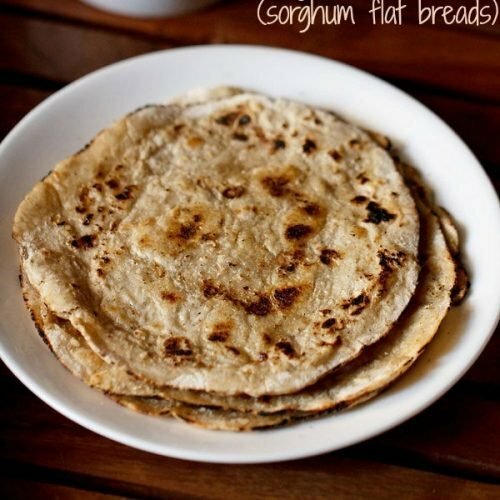 jowar roti recipe with step by step pics – jowar roti or jowar bhakri are flat breads made with sorghum flour. these rotis are also called as jolada rotti in karnataka. sorghum is a healthy millet which is good in minerals like calcium, potassium, phosphorous and iron. being rich in antioxidants, its good for the heart too and is diabetic friendly. jowar is also an excellent gluten free flour. 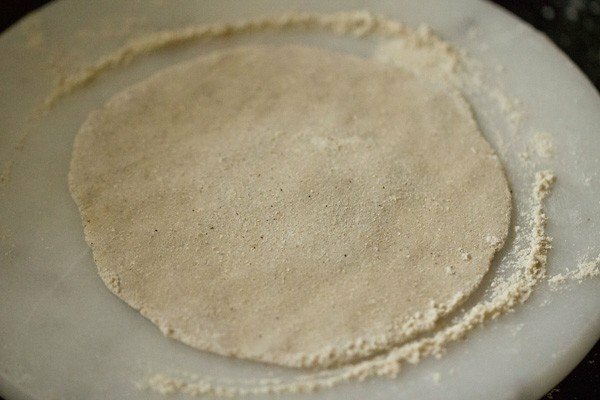 jowar roti have a nice soft texture and even on cooling do not become hard or chewy. on my visits to some parts of maharashtra, we were served jowar roti in a thali with pitla (a thick but moist gram flour paste spiced dish) and green chili thecha (coarse green chili & garlic chutney). jowar bhakris can also be served with zunka (a dry version of pitla). usually when i make bajra or jowar roti, i also make a maharashtrian based curry to go with it like batata rassa, vangi rassa, mixed sprouts curry, veg kolhapuri, bharli vangi or usal. this time i served with mixed sprouts usal. i make these millet and gluten free rotis season wise. in summers i make jowar roti & ragi roti. in winters & monsoons i make makki ki roti (maize flour flat bread) and bajra roti (pearl millet flat bread). and when we fast during some days, i make rajgira paratha (amaranth flour flat bread) or kuttu ka paratha (buckwheat flour flat bread). 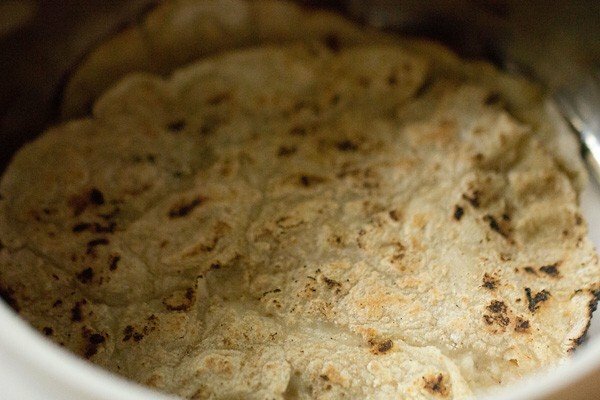 these jowar bhakri are fairly easy to make if you have the practice. i make them couple of times in a month. i make small to medium sized rotis as i am not good in making large rotis. 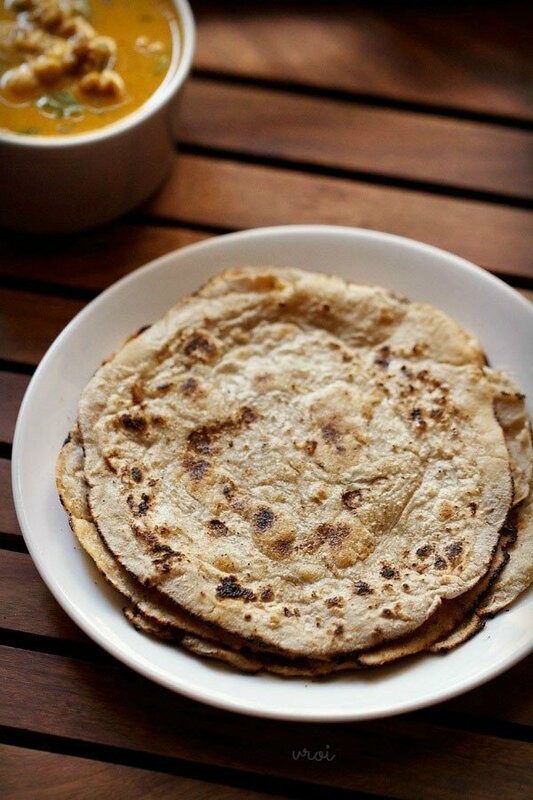 the jowar roti can be served with any veggie gravy dish. 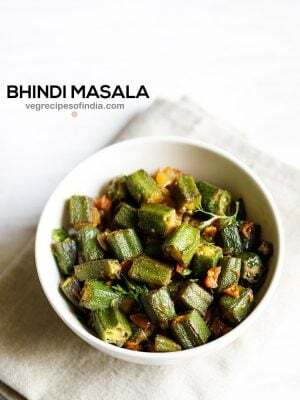 they also taste good with a dry chutney like peanut thecha. 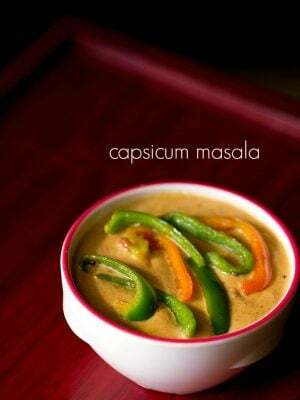 in a bowl or a large plate with rim/parat take 1 cup jowar flour. add 2 to 3 pinches of salt and mix it with the flour. then add about 1/2 cup hot water. with a spoon, mix the water with the jowar flour. add remaining ¼ cup water more and again mix. overall i added ¾ cup water. however, the water amount depends on the type of flour, whether it is fine or slightly coarse. hence add accordingly. when the heat is enough to handle, then knead the dough with your hands. knead very well. 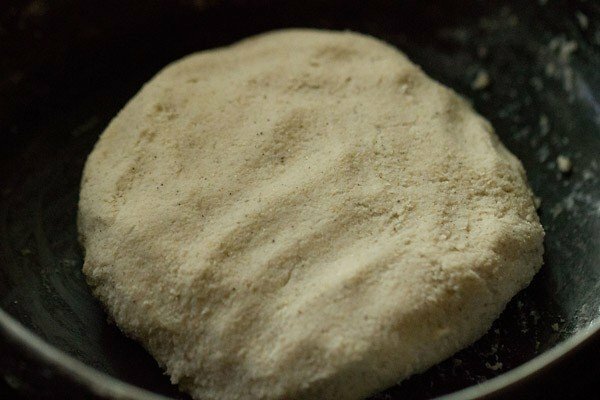 if the dough feels sticky or pasty, then add some more of the jowar flour. cover and keep the dough aside, till it comes at room temperature. now make small to medium sized balls of the dough. sprinkle a good amount of jowar flour on the rolling board. flatten a ball and place it on the flour. add some more flour on top. with your palms, lightly press as well as rotate the roti. add more flour if required. if you are unable to do this way, then roll the dough ball between two butter papers or ziplock bag. you can also flatten the dough ball on a moist napkin. now with a spatula gently lift up the roti. 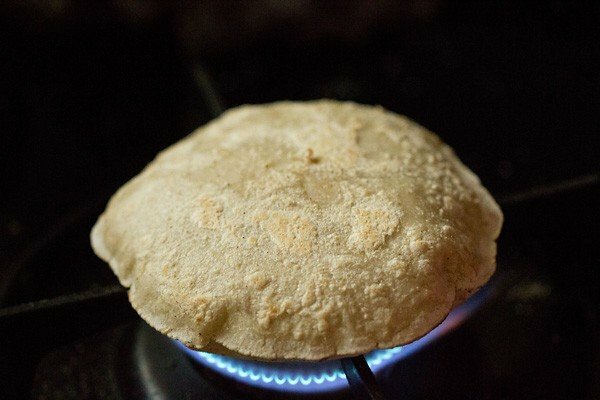 then place jowar roti on a hot tava with the floured side facing you. spread some water all over the roti, on this side with your fingers. let the base cook ¼th and then flip the roti. allow this watered side to cook till you see light brown spots. with a pair of tongs lift the jowar roti, invert and then place it on the fire. the roti or bhakri will begin to puff up. invert and cook the other side of the jowar roti on the flame. when you see some black spots and the jowar roti cooked well, remove and place in a roti basket. 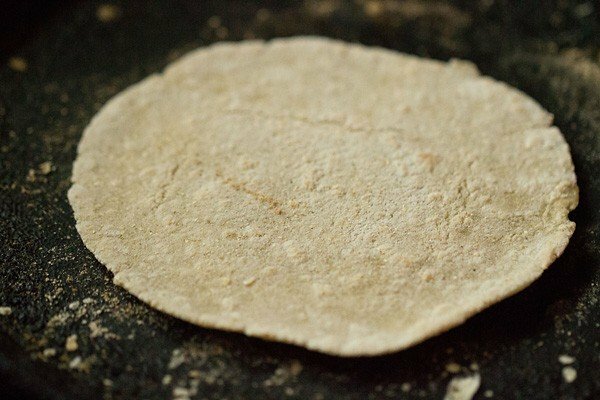 serve these jowar roti hot or warm with a regional indian veggie dish or a legume dish. if you want you can spread some ghee or white butter on the jowar roti. the recipe can be doubled as well as tripled. 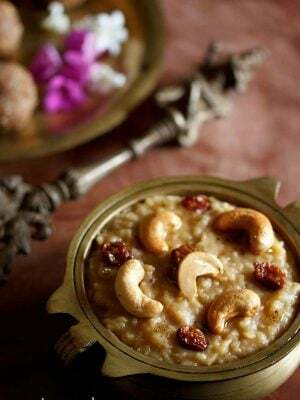 1. in a bowl or a large plate with rim/parat take 1 cup jowar flour. add 2 to 3 pinches of salt (about ⅛ tsp) and mix it with the flour. 2. then add about ½ cup hot water. 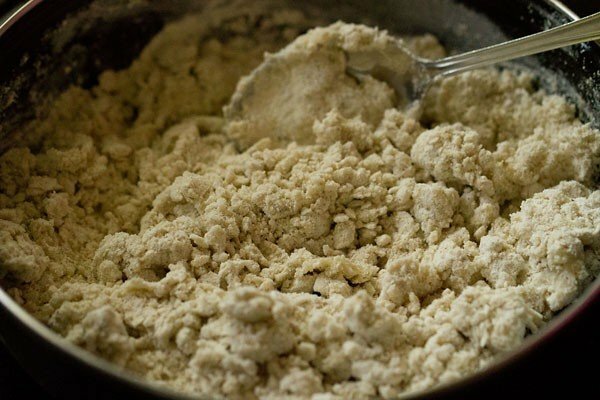 3. with a spoon or spatula, stir and mix the water with the jowar flour. 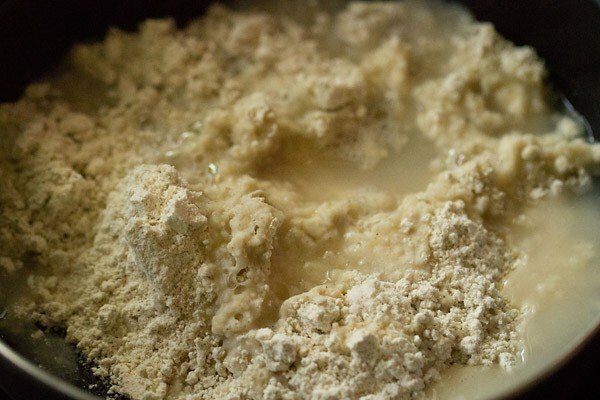 4. add remaining ¼ cup water more and again mix & stir incorporating the water in the flour. overall i added ¾ cup water. however, the water amount depends on the type of flour, whether it is fine or slightly coarse. hence add accordingly. 5. when the heat is enough to handle, then knead the dough with your hands. knead really well. the dough should be hot when you knead it. 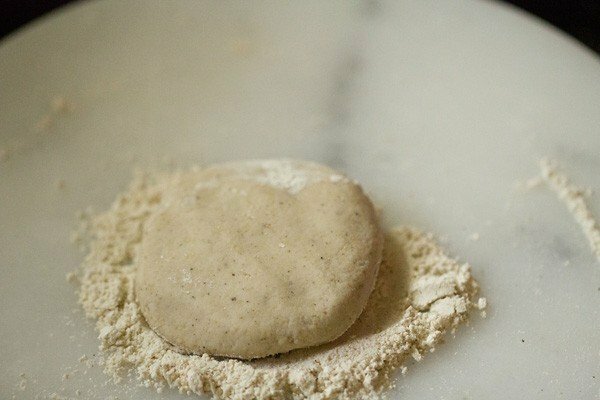 if the dough feels sticky or pasty, then add some more of the jowar flour. cover and keep the dough aside, till it comes at room temperature. 6. now make small to medium sized balls of the dough. sprinkle a good amount of jowar flour on the rolling board. flatten a ball and place it on the flour. add some more flour on top. 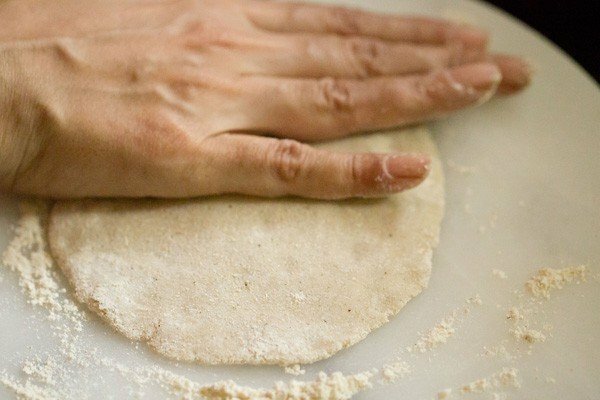 7. with your palms, lightly press as well as rotate the roti. add more flour if required. 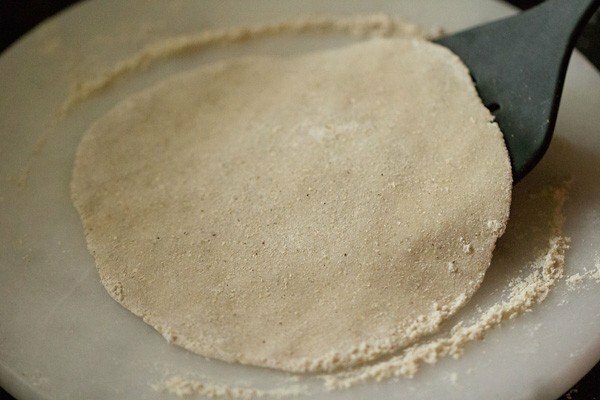 if you are unable to do this way, then roll the dough ball between two butter papers or ziplock bag as shown in this bajra roti recipe. 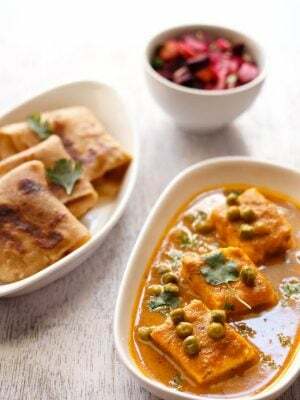 you can also flatten the dough ball on a moist napkin as shown in this rajgira paratha recipe. 8. here the roti is done. 9. now with a spatula gently lift up the roti. 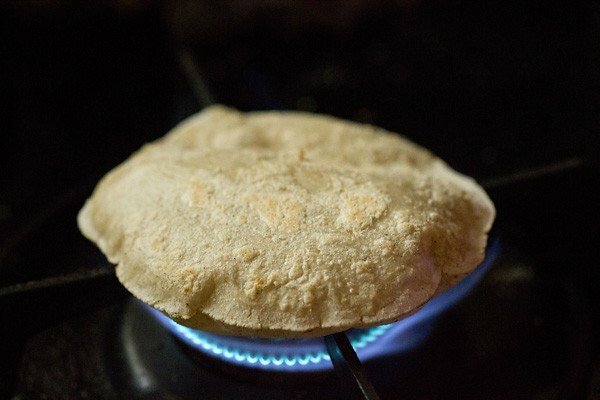 10. then place jowar roti on a hot tava with the floured side facing you. 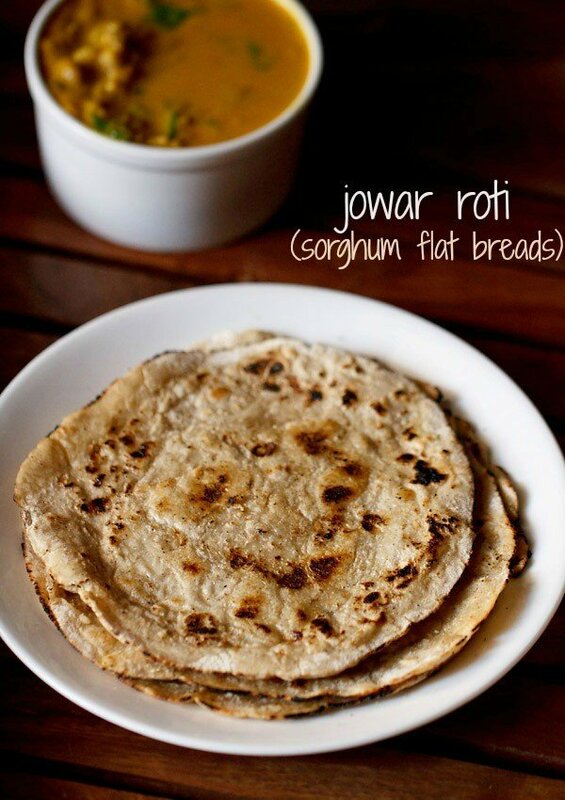 11. spread some water all over the jowar roti with your fingers. 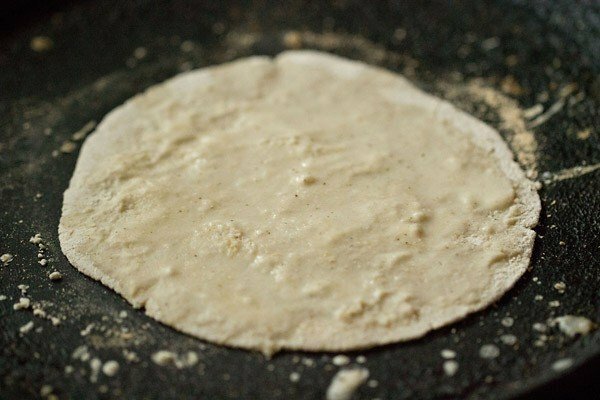 12. let the base cook ¼th and then flip the jowar roti. allow this watered side to cook till you see light brown spots. 13. with a pair of tongs lift the roti, invert and then place it on the fire. the roti or jowar bhakri will begin to puff up. 14. here the jowar roti has puffed up well. 15. invert and cook the other side of the jowar roti on the flame. 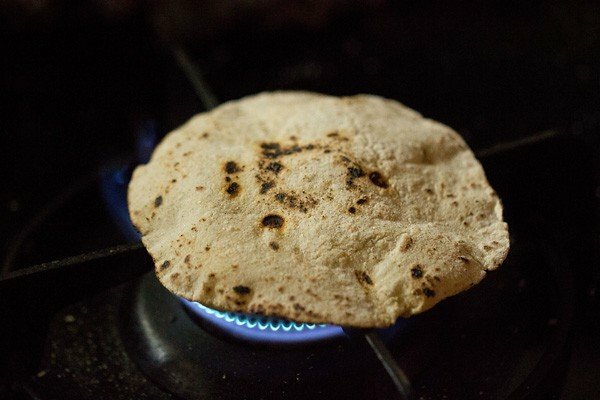 16. when you see some charred spots and the jowar roti has cooked well, remove and place in a roti basket. 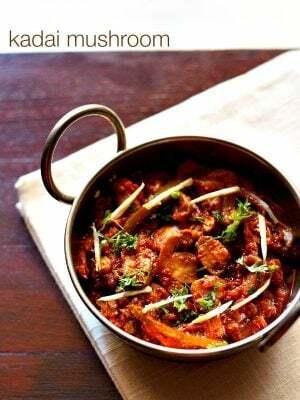 17. serve jowar roti hot or warm with a regional indian veggie dish or a lentil-legume dish. if you want you can spread some ghee or white butter on the jowar roti. 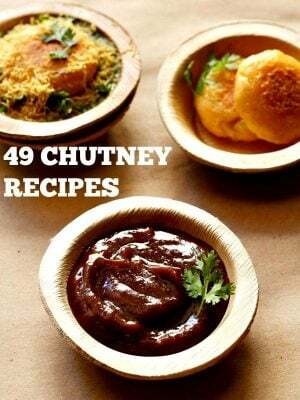 I like your recipes n visit your website quite often. The tips,the way you share it,it’s very comfortable. I tried your makki di roti and saag.Also the jowari roti. It came very well. The rotis were soft. And you are first person I have written my opinion..
thank you ramya for sharing your views and feedback on the recipes. i am glad that the recipe worked well. happy cooking. Hi Dassana, I tried making rotis with jowar flour today. Came out ok. I made them in small size, to start with. I have a few queries. Can you answer them, please? 1. 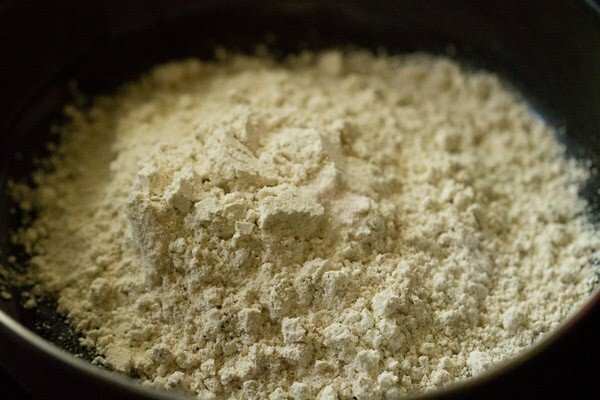 If the flour is coarse, should we add more hot water? 2. After kneading the dough, how should it be? It does not come together like dough made from wheat flour. 3. How to ensure that the rotis are soft? If we keep them in a casserole, how long can we keep them soft and fairly hot? 4. Is it better to roll the rotis and side by side prepare them on the tava? Or can we roll out the rotis first and then prepare them on the tava? 1. for coarse flour, add more hot water as coarser grains will absorb more water. 2. after kneading, the dough should come together. it has to be soft and be like one ball of dough. if its not coming together means that more water (moisture) is needed. 3. if you keep them in a casserole or wrapped in a steel dabba (box) between a cotton kitchen napkin, then the jowar rotis will stay soft. they will be warm for about 30 to 45 minutes at the most and then they will cool down. but they will remain soft for a day also. 4. i usually prepare side by side. you can even make the rotis before and then roast them. but here you have to be careful to place and then remove them gently, so that they do not break. if kept in the fridge, then this problem does occur. try sprinkling some more water as in the fridge the dough becomes dry. mix and knead and then make the rotis. hope this helps. Welcome Ashwini. You can spread some oil or ghee on it and wrap it in a cloth napkin. I am new to baking and cooking with sorghum in any form. I know this sounds silly, but reading your recipe has made me feel so much more at ease about making roti with sorghum flour. I now feel it is such a pity I am not near you, otherwise I could learn from you. Thanks Rosa for your positive feedback. Its alright, we all learn at some stage of life. Hi! Today i tried making bhakris. But my bhakri was breaking while pressing with palms?? I think something went wrong? Or probably thts not my department? more water in the dough. thats why the bhakri was breaking. some more flour bajra flour added could have rectified the situation. 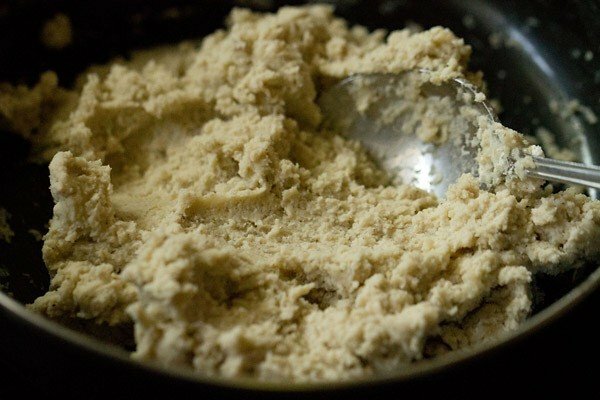 As you have a recipe posted on making chapati dough using kitchenaid stand mixer…. Any luck on trying this stand mixer to knead the jowar dough of this recipe? ashwini, i always knead jowar or bajra dough with hands. i do not use kitchenaid stand mixer for this, since i do not make very large amounts of the dough. but you can try. just add water in parts and knead at medium speed in the stand mixer. I’m really worried about the measuring you have done ,like you see you have used 100 gms of flour to make 6-8 rotis, I mean I make rotis of approximately 70-80 gms in wt each ,kindly update,thx in advance. the difference is because i made small thin rotis. not big ones or thick ones. if you make big rotis, then obviously then the weight in grams of the flour will increase. also the weight of the cooked rotis will be more than the weight of the flour. 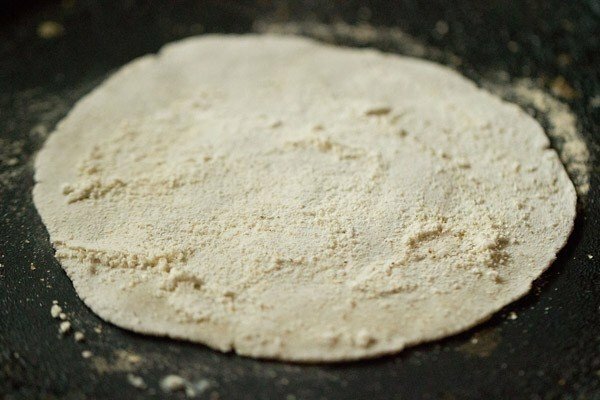 nice step by step recipe, it is an nearmost everyday 1 time roti in most of maharashtrian homes we make it directly after making the dough and we dont use any hot water for it. Best when served with steaming hot ‘Pithle’ and ‘Hirwyairchi cha thecha. agree best with pithle and thecha. you will need to keep a wired rack on top of the hob and then place the roti on the wired rack. what is the shelf life of bajri, jowar, raagi and makai flours?? suman, i think its 6 months or so. but it is better to check the packaging information as it is mentioned in the flour packet. 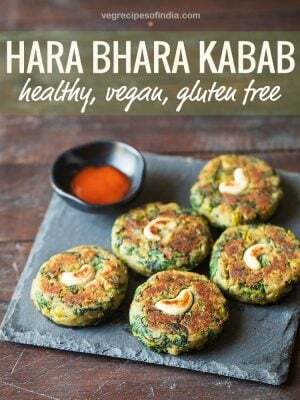 Btw I have some questions, can I add aata so that it can be rolled easily like you did in bajra roti? Also while cooking can’t it be cooked like chapati with oil directly? but instead of dry rolling, it is easy to roll the ball on wet thin cloth by prressing with palm. This help in taking off roti from cloth easily and make roti soft. I usually use this tecnique in making rice floor roti, corn floor roti, and potato kachori. uzma, i agree with you and i have already mentioned it in the post. but its not easy for everybody.